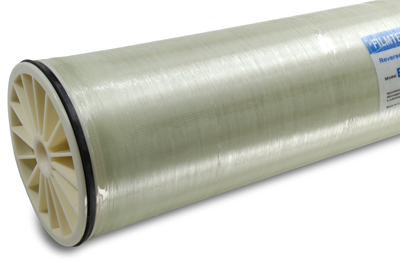 Filmtec Industrial Brackish Water Membrane Elements | Applied Membranes Inc.
DOW FILMTEC™ Brackish Water RO Elements with a 8-inch diameter provide consistently high performance and enhanced element life when treating difficult industrial water, enabling lower energy usage and reduced costs. LE & XLE elements reduce operating costs due to lower energy requirements. DOW FILMTEC BW30-365 and BW30-400/34 Elements use thick 34 mil feed spacer to minimize the impact of fouling and are ideal for reverse osmosis plant managers and operators dealing with challenging waters and wastewaters and looking for consistent, high performance, long element life and increased productivity. DOW FILMTEC BW30-400 and BW30HR-440 Elements are ideal for reverse osmosis plant managers and operators dealing with controlled pre-treatment waters and seeking consistency, high performance, long element life, increase productivity, high water quality. The DOW FILMTEC low energy and extra low energy, high productivity brackish water reverse osmosis elements are designed to deliver high quality water at low operating costs for municipal and industrial water applications. DOW FilmTec LE and XLE Elements provide lower energy costs and more productivity, especially in cold waters, and minimize equipment CAPEX in designs with savings in elements and pumping. DOW FILMTEC Fouling Resistant reverse osmosis elements incorporate Dow's proprietary FR (fouling resistant) membrane technology that provides excellent fouling resistance and cleanability and are designed to purify water with high biological or organic fouling potential in systems with well-controlled pretreatment. This high rejection membrane has a wide pH cleaning range (pH 1-13) that allows for effective cleaning of scale, organic compounds, and biofilm. These features offer system operators some of the best long-term economics and most trouble-free operation for RO membrane purification of fouling water. Permeate flow rate and salt rejection shown on this page are based on the following test conditions: 2,000ppm NaCl, design pressures listed above, 77°F (25°C), and 15% recovery. Permeate flow rates for individual elements may vary +25/-15%. The above specifications are benchmark values. Please be sure to operate according to our system design guidelines. Please see individual products’ specification sheet for operating limits and guidelines. DOW FilmTecBrackish Water Reverse Osmosis 8" Elements can separate salts from water and are produced with an automated fabrication process that ensures precision, consistency, and reliability. They are ideal for use in large-scale industrial and municipal water treatment systems that produce greater than approximately 10 gpm (2300 L/h) of permeate. 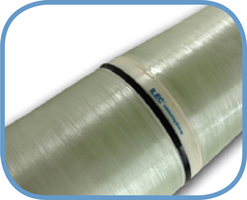 Our RO membranes build on a tradition of leadership in the thin-film composite membrane industry and meet today's challenges for higher rejection using less energy and resisting foulants in challenging waters. 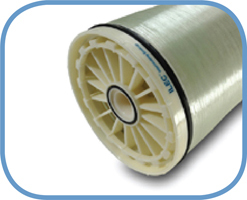 Many models are available in iLEC interlocking style for direct connection of membranes in multi-element housings.